Add More Detail About How You Heard About Us. Complete this form to request a quote | A representative from Greiman Construction Services, LC will respond within 24 hours. At Greiman construction we’ve been serving the great residents of Iowa for many years. We understand the many issues local residents have who need emergency roof repair or need a high quality experienced roofing company. We provide a full suite of residential roofing services. Whether you need a new roof installed or storm damage repaired, our team of skilled contractors are here to help. We are also one of the few GAF certified roofers. We know you’ll love our quality and great service! At Greiman you’ve got options! Our very extensive selections will have you covered no matter the budget, design style or particular taste. As lifelong North Iowa residents we understand the types of siding that go best in our neighborhoods. We offer dramatic styles, varied color palettes and a wide-range of finishes. Our top quality siding types feature the latest siding technologies and color protection with an outstanding warranty for your protection. For over three generations, the Greiman family has provided northern Iowa with amazing home construction and commercial roofing. Our team maintains a belief in the values that our company was founded with: reliability, quality craftsmanship, and durability of exceptional products. Our team is built on friendly and reliable services. These are services that you can count on for all your roofing and siding needs. Do your diligence. 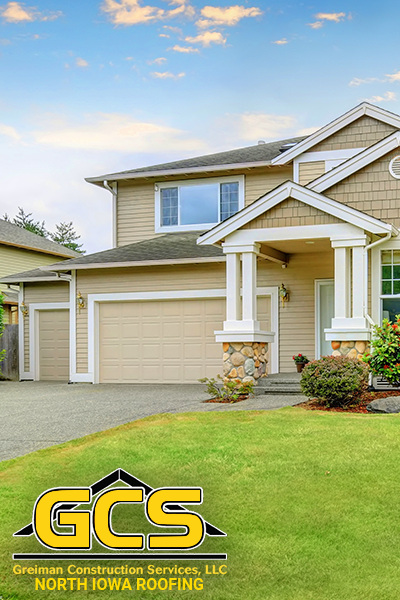 It’s your home, make sure you are protected with quality workmanship as well as top of the line products and warranties. For years, leading roofing contractor Greiman Construction Services has been providing roofing and exterior services in Garner, Clear Lake, Algona, Mason City, and the surrounding North Iowa area as well as Cedar Rapids. We are certified and insured. We specializing in residential, commercial roofing and exterior services. Our residential roofing and exterior technicians are certified and trained in all the latest techniques and products. This knowledge sets us apart from other fly by night roofing and exterior companies who are less educated and take chances with your home. Don’t let your home be their education. Educate yourself, make sure your roofer is certified. We are a GAF Master Elite Certified roof installation company. There are only 24 Iowan contractors who are Master Elite certified. Our website is designed to allow you to qualify our company, research services and review products and warranty options before you even contact us. This pre selection process saves time and provides our estimators and Greiman Construction Services home assistance specialists the information needed for your initial quote. Quick Tip – Print or save copies of our warranty information for your personal records. Even if you don’t do business with us, keep them as a standard to hold against other contractors being considered.